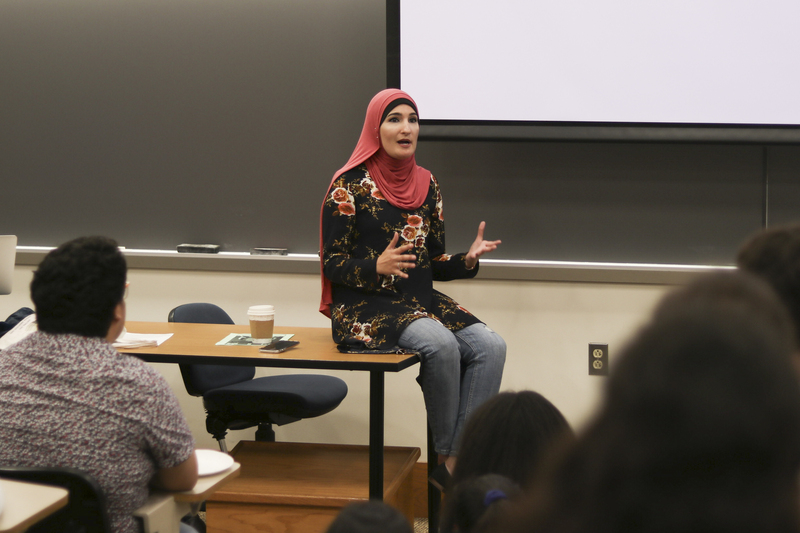 Last Friday evening, activist Linda Sarsour spoke to a packed room in Judd Hall about her work and answered questions from audience members. The event, titled “An Evening with Linda Sarsour,” was hosted by the Wesleyan Muslim Student Association (MSA) and co-sponsored by a number of other campus groups and academic departments. Sarsour, a Palestinian Muslim American and born-and-raised New Yorker, has been at the head of numerous civil rights campaigns for years. In 2015, Sarsour co-chaired the March2Justice, a 250-mile, 100-person march from New York City to Washington, D.C., and in 2017, she co-chaired the Women’s March on Washington, which saw millions of people participating in demonstrations around the world. Sarsour is also the former Executive Director of the Arab American Association of New York and a co-founder of an online Muslim organization called MPOWER Change, and she was central to New York City Public School’s recent recognition of two Muslim holidays in its academic calendar. Sarsour began the event, which functioned as a discussion, by speaking about her faith and stating that Islam is a religion of social justice. She spoke about the issue of sexism and misogyny in Islam and how she is beginning to see women leading community discussions in response to these issues. A member of the audience spoke about her lack of exposure to these discussions when she was growing up. Sarsour responded that we have given certain people the power to control the conversation surrounding these issues and that Muslims need to demand that these conversations happen within their communities. In doing so, she stressed that people, especially members of the political left, need to conduct these discussions with language that is accessible to everyone. She commented on how the political left has become intellectualized in a way that is off-putting and self-destructive. Another student questioned Sarsour’s characterization of what she termed “the opposition” as racist, sexist, and homophobic. The student saw this as simplifying issues that are actually much more complex than single words like these could indicate. In response, Sarsour recognized the underlying fears that accompany these hateful ideologies and encouraged audience members to speak to their family and friends about why they believe what they do. The question that followed addressed Sarsour’s position as both an activist and a celebrity. Sarsour spoke about making sure to hold herself accountable to her ideals and said that no one sees the days she cannot get out of bed because of the stresses of her work. She spoke about a time last summer when, after using the word “jihad” to advocate for nonviolent resistance to President Trump in a speech at the Islamic Center of North America convention, she became the target of massive amounts of online hate. One of the final questions came from a student who referenced an interview Sarsour did with The National titled “Can You Be a Zionist Feminist? Linda Sarsour Says No.” In the interview, Sarsour criticizes a New York Times op-ed written by Emily Shire in which Shire argues that she should not have to sacrifice her identity as a Zionist in order to be accepted by the feminist movement. Linda expressed appreciation for this type of question and the discussion it allowed for. She responded by correcting the student, stating that in the interview, she does not say that Zionism on its own conflicts with feminism but that, since feminism stands for fighting for all women, you cannot consider yourself a feminist if you do not stand up for Palestinian women. She also stated that the student was incorrectly conflating Judaism and Zionism, which allowed him to make the claim that her beliefs have anti-semitic consequences. In an interview with the Argus, Eunes Harun ’20, the Event President of the MSA, spoke about planning the event over the summer. The event came to be after Ann Raskin of the Connecticut Citizen Action Group (CCAG) contacted Imam Sami Aziz about the possibility of Sarsour coming to Middletown the day before the CCAG’s event, Thousands of Doors for Justice. Harun worked with Director of the Center for the Americas Kehaulani Kauanui to secure funding for a hotel and honorarium (which Sarsour did not request but Harun and Kauanui wanted to provide) and work with the University to make the event happen. Kauanui also got many other academic departments involved in order to increase publicity of the event and turnout. In emails to the Argus, moderators Azher Jaweed ’19 and Aysha Khan ’19 discussed their goals for the event and what they hoped audience members got from it. Khan talked about making a change to the question-answer format minutes before the event began. Khan also discussed what she thought of Linda before the event. Jaweed spoke about how the event aligned with the mission of the MSA.